Messier 36 (M36), also known as the Pinwheel Cluster, is an open cluster located in the northern constellation Auriga, the Charioteer. Messier 36 occupies an area of 12 arc minutes in the sky, corresponding to a linear extension of 14 light years. The cluster has an apparent magnitude of 6.3 and lies at a distance of 4,100 light years from Earth. It has the designation NGC 1960 in the New General Catalogue. The Pinwheel Cluster contains at least 60 stars and bears a resemblance to the more famous Pleiades cluster (M45) in the constellation Taurus. 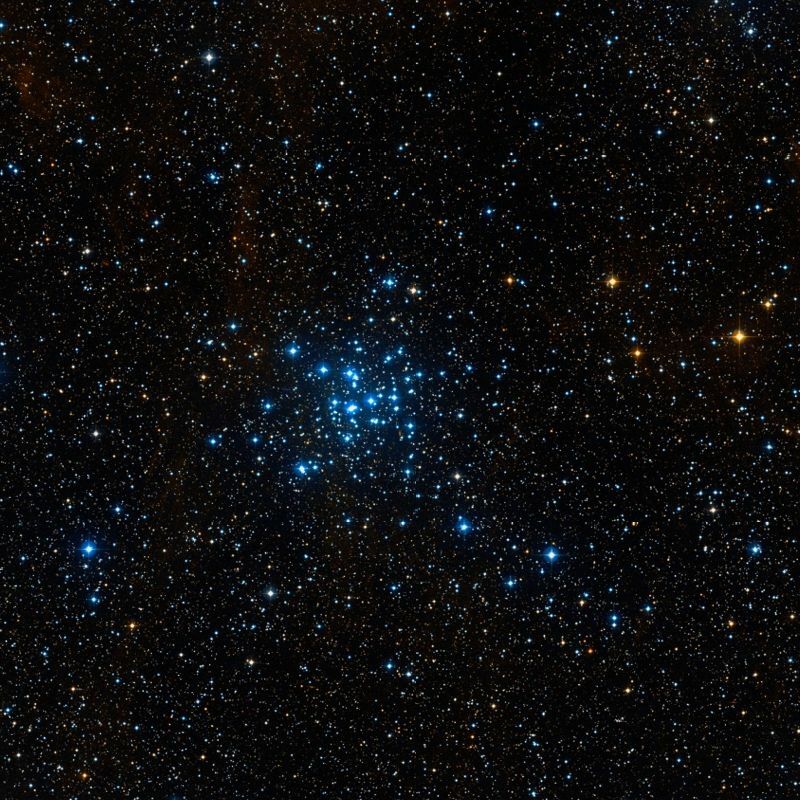 The two clusters have almost the same physical size and, like many members of the Pleiades cluster, many members of M36 are also rapid spinners. M36, however, is one of the most distant open clusters catalogued by Messier and about 10 times as far away as the Pleiades. Messier 36 is one of the fainter open clusters in Messier’s catalogue, but it can easily be seen in binoculars and small telescopes. Binoculars will show a faint, fuzzy patch of light and small telescopes at low or medium powers will reveal just over a dozen brightest stars in the cluster, arranged in an X-type shape. 6-inch telescopes will resolve about 25 stars, while 12-inch instruments will reveal stars across the cluster. The Pinwheel Cluster can be found by following a line drawn from Alnath (El Nath) in Taurus to Menkalinan in Auriga constellation. Auriga, the celestial Charioteer, is easy to find because its brightest stars form a pentagon just above Orion, to the northwest of Gemini and northeast of Taurus and the Pleiades cluster. 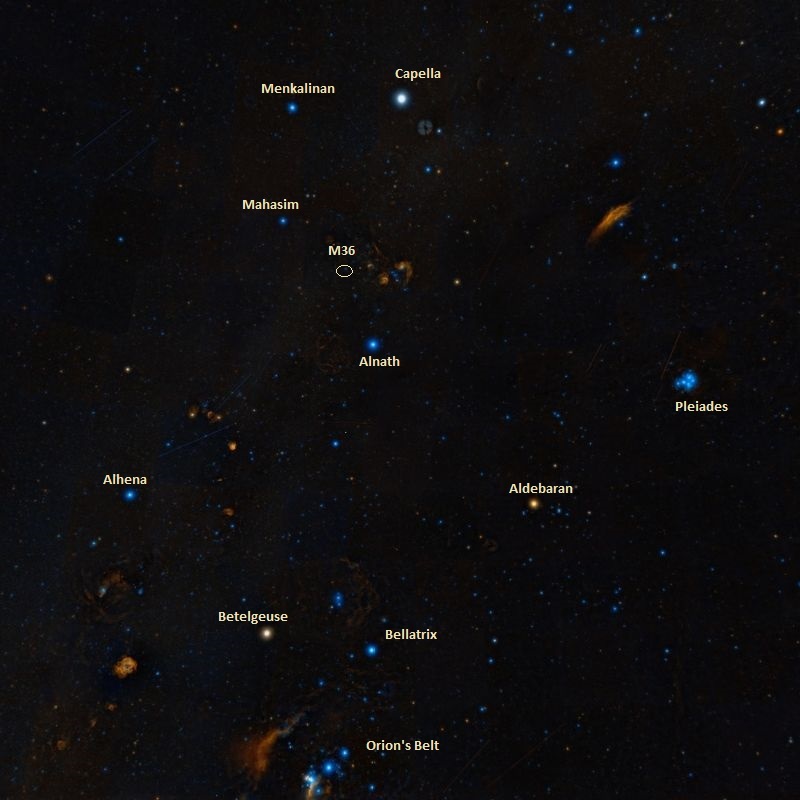 Alnath, the second brightest star in Taurus, appears on the narrow end of the pentagon asterism. Menkalinan is located 7.5 degrees east of Capella, the third brightest star in the northern celestial hemisphere. The best time of year to observe M36 is during the winter months, when Auriga constellation is prominent in the night sky. With an estimated age of 25 million years, Messier 36 is relatively young and does not have any red giant stars. The brightest confirmed members are of apparent magnitude 9 and have the stellar classification B2. The brightest star in M36 is about 360 times more luminous than the Sun. The cluster is classified as Trumpler type I,3,m, which means that it is detached with strong central concentration (I), composed of both bright and faint stars (3), and medium rich, with 50 to 100 members. 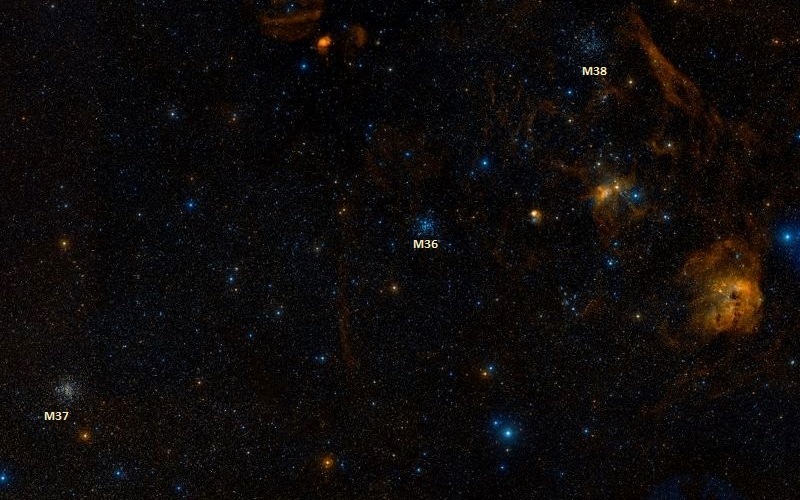 Messier 36 is one of the three bright star clusters in Auriga recorded by Messier. Like the other two – Messier 37 and Messier 38 – M36 is located in the southern part of the constellation. It is the smallest and least populated of the three clusters. The cluster was discovered by the Italian astronomer Giovanni Battista Hodierna before 1654. Guillaume Le Gentil found M36 and M38 independently in 1749. 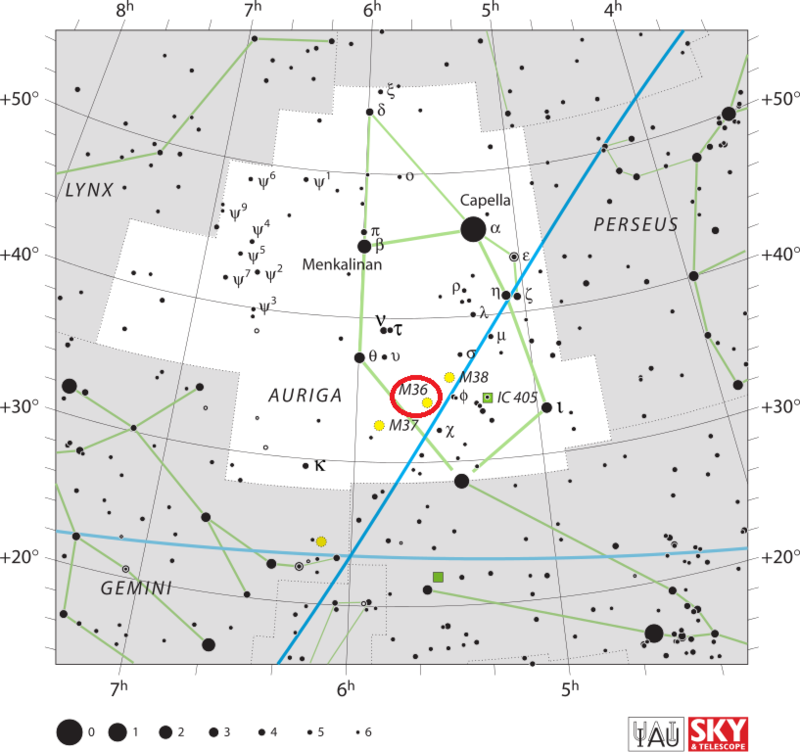 In the night of September 2 to 3, 1764, I have determined the position of a star cluster in Auriga, near the star Phi of that constellation. With an ordinary [non-achromatic] refractor of 3 feet & a half, one has difficulty to distinguish these small stars; but when employing a stronger instrument, one sees them very well; they don’t contain between them any nebulosity: their extension is about 9 minutes of arc. I have compared the middle of this cluster with the star Phi Aurigae, & I have determined its position; its right ascension was 80d 11′ 42″, & its declination 34d 8′ 6″ north. 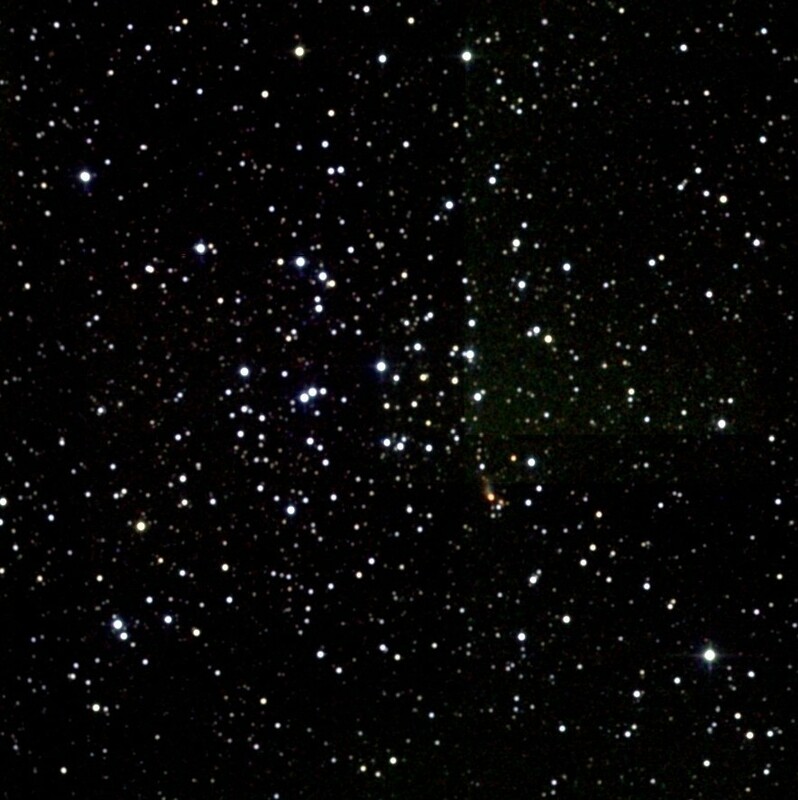 Messier 36 (Pinwheel Cluster). Atlas Image mosaic obtained as part of the Two Micron All Sky Survey (2MASS), a joint project of the University of Massachusetts and the Infrared Processing and Analysis Center/California Institute of Technology, funded by the National Aeronautics and Space Administration and the National Science Foundation. A neat double star in a splendid cluster, on the robe below the Waggoner‘s left thigh, and near the centre of the Galaxy stream. A [mag] 8 and B 9, both white; in a rich though open splash of stars from the 8th to the 14th magnitudes, with numerous outliers, like the device of a star whose rays are formed by very small stars. This object was registered by M. [Messier] in 1764; and the double star, as H. [John Herschel] remarks, is admirably placed, for future astronomers to ascertain whether there be internal motion in clusters. A line carried from the central star in Orion’s belt, through Zeta Tauri, and continued about 13deg beyond, will reach the cluster, following Phi Aurigae by about two degrees.